Breton (/ˈbrɛtən/; brezhoneg [bʁeˈzõːnɛk] ( listen) or [brəhõˈnek] in Morbihan) is a member of the Brittonic Southwestern Brittonic branch of the Celtic languages spoken in Brittany. Breton was brought from Great Britain to Armorica by migrating Britons during the Early Middle Ages; it is thus an Insular Celtic language, though closely related to the Continental Celtic Gaulish language which had been spoken in pre-Roman Gaul. Breton is most closely related to Cornish, both being Southwestern Brittonic languages. Welsh and the extinct Cumbric are the more distantly related Western Brittonic languages. The other regional language of Brittany, Gallo, is a langue d'oïl. Gallo is a Romance language descended from Latin (unlike the similarly named ancient Celtic language Gaulish), and a close relative of French. Having declined from more than 1,000,000 speakers around 1950 to about 200,000 in the first decade of the 21st century, Breton is classified as "severely endangered" by the UNESCO Atlas of the World's Languages in Danger. However, the number of children attending bilingual classes has risen 33% between 2006 and 2012 to 14,709. 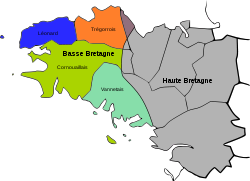 Breton is spoken in Lower Brittany (Breton: Breizh-Izel), roughly to the west of a line linking Plouha (west of Saint-Brieuc) and La Roche-Bernard (east of Vannes). It comes from a Brittonic language community that once extended from Great Britain to Armorica (present-day Brittany) and had even established a toehold in Galicia (in present-day Spain). Old Breton is attested from the 9th century. It was the language of the upper classes until the 12th century, after which it became the language of commoners in Lower Brittany. The nobility, followed by the bourgeoisie, adopted French. The written language of the Duchy of Brittany was Latin, switching to French in the 15th century. There exists a limited tradition of Breton literature. Some Old Breton vocabulary remains in the present day as philosophical and scientific terms in Modern Breton. The recognized stages of the Breton language are: Old Breton - c.800 to c.1100, Middle Breton - c.1100 to c.1650, Modern Breton - c.1650 to present. The French monarchy was not concerned with the minority languages of France spoken by the lower classes, and required the use of French for government business as part of its policy of national unity. During the French Revolution, the government introduced policies favouring French over the regional languages, which it pejoratively referred to as patois. The revolutionaries assumed that reactionary and monarchist forces preferred regional languages to try to keep the peasant masses underinformed. In 1794, Bertrand Barère submitted his "report on the patois" to the Committee of Public Safety in which he said that "federalism and superstition speak Breton". Since the 19th century, under the Third, Fourth and Fifth Republics, the government has attempted to stamp out minority languages, including Breton, in state schools, in an effort to build a national culture. Teachers humiliated students for using their regional languages, and such practices prevailed until the late 1960s. In the early 21st century, due to the political centralization of France, the influence of the media, and the increasing mobility of people, only about 200,000 people can speak Breton, a dramatic decline from more than a million in 1950. The majority of today's speakers are more than 60 years old, and Breton is now classified as an endangered language. At the beginning of the 20th century, half of the population of Lower Brittany knew only Breton; the other half were bilingual. By 1950, there were only 100,000 monolingual Bretons, and this rapid decline has continued, with likely no monolingual speakers left today. A statistical survey in 1997 found around 300,000 speakers in Lower Brittany, of whom about 190,000 were aged 60 or older. Few 15- to 19-year-olds spoke Breton. In 1925, Professor Roparz Hemon founded the Breton-language review Gwalarn. During its 19-year run, Gwalarn tried to raise the language to the level of a great international language. Its publication encouraged the creation of original literature in all genres, and proposed Breton translations of internationally recognized foreign works. In 1946, Al Liamm replaced Gwalarn. Other Breton-language periodicals have been published, which established a fairly large body of literature for a minority language. The Asterix comic series has been translated into Breton. According to the comic, the Gaulish village where Asterix lives is in the Armorica peninsula, which is now Brittany. Some other popular comics have also been translated into Breton, including The Adventures of Tintin, Spirou, Titeuf, Hägar the Horrible, Peanuts and Yakari. Some original media are created in Breton. The sitcom, Ken Tuch, is in Breton. Radio Kerne, broadcasting from Finistère, has exclusively Breton programming. Some movies (Lancelot du Lac, Shakespeare in Love, Marion du Faouet, Sezneg) and TV series (Columbo, Perry Mason) have also been translated and broadcast in Breton. Poets, singers, linguists, and writers who have written in Breton, including Yann-Ber Kalloc'h, Roparz Hemon, Anjela Duval, Xavier de Langlais, Pêr-Jakez Helias, Youenn Gwernig, Glenmor and Alan Stivell are now known internationally. The first Breton dictionary, the Catholicon, was also the first French dictionary. Edited by Jehan Lagadec in 1464, it was a trilingual work containing Breton, French and Latin. Today bilingual dictionaries have been published for Breton and languages including English, Dutch, German, Spanish and Welsh. A new generation[clarification needed] is determined to gain international recognition for Breton. The monolingual dictionary, Geriadur Brezhoneg an Here (1995), defines Breton words in Breton. The first edition contained about 10,000 words, and the second edition of 2001 contains 20,000 words. 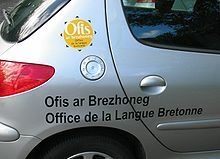 In the early 21st century, the Ofis ar Brezhoneg ("Office of the Breton language") began a campaign to encourage daily use of Breton in the region by both businesses and local communes. Efforts include installing bilingual signs and posters for regional events, as well as encouraging the use of the Spilhennig to let speakers identify each other. The office also started an Internationalization and localization policy asking Google, Firefox and SPIP to develop their interfaces in Breton. In 2004, the Breton Wikipedia started, which now counts more than 65,000 articles. In March 2007, the Ofis ar Brezhoneg signed a tripartite agreement with Regional Council of Brittany and Microsoft for the consideration of the Breton language in Microsoft products. In October 2014, Facebook added Breton as one of its 121 languages. after three years of talks between the Ofis and Facebook. Breton is spoken mainly in Lower Brittany, but also in a more dispersed way in Upper Brittany (where Gallo is spoken alongside Breton and French), and in areas around the world that have Breton emigrants. The four traditional dialects of Breton correspond to medieval bishoprics rather than to linguistic divisions. They are leoneg (léonard, of the county of Léon), tregerieg (trégorrois, of Trégor), kerneveg (cornouaillais, of Cornouaille), and gwenedeg (vannetais, of Vannes). Guérandais was spoken up to the beginning of the 20th century in the region of Guérande and Batz-sur-Mer. There are no clear boundaries between the dialects because they form a dialect continuum, varying only slightly from one village to the next. Gwenedeg, however, is almost mutually unintelligible with most of the other dialects. Ofis Publik ar Brezhoneg, the Breton language agency, was set up in 1999 by the Brittany region to promote and develop the use of Breton. As noted, only French is an official language of France. Supporters of Breton and other minority languages continue to argue for their recognition, education in public schools and place in public life. In July 2008, the legislature amended the French Constitution, adding article 75-1: les langues régionales appartiennent au patrimoine de la France (the regional languages belong to the heritage of France). The European Charter for Regional or Minority Languages, which obliges signatory states to recognize minority and regional languages, was signed by France in 1999 but has not been ratified. On 27 October 2015, the Senate rejected a draft constitutional law ratifying the charter. Regional and departmental authorities use Breton to a very limited extent, for example in signage. Some bilingual signage has also been installed, such as street name signs in Breton towns. One station of the Rennes metro system has signs in both French and Breton. Under the French law known as Toubon, it is illegal for commercial signage to be in Breton alone. Signs must be bilingual or French only. Since commercial signage usually has limited physical space, most businesses have signs only in French. Ofis Publik ar Brezhoneg, the Breton language agency, was set up in 1999 by the Brittany region to promote and develop the daily use of Breton. It created the Ya d'ar brezhoneg campaign, to encourage enterprises, organisations and communes to promote the use of Breton, for example by installing bilingual signage or translating their websites into Breton. In the late 20th century, the French government considered incorporating the independent Breton-language immersion schools (called Diwan) into the state education system. This action was blocked by the French Constitutional Council based on the 1994 amendment to the Constitution that establishes French as the language of the republic. Therefore, no other language may be used as a language of instruction in state schools. The Toubon Law implemented the amendment, asserting that French is the language of public education. The Diwan schools were founded in Brittany in 1977 to teach Breton by immersion. They taught a few thousand young people from elementary school to high school. They have gained fame owing to their high level of results in school exams. Breton-language schools do not receive funding from the national government, though the Brittany Region may fund them. Another teaching method is a bilingual approach by Div Yezh ("Two Languages") in the State schools, created in 1979. Dihun ("Awakening") was created in 1990 for bilingual education in the Catholic schools. In 2018, 18,337 pupils (about 2.00% of all pupils in Brittany) attended Diwan, Div Yezh and Dihun schools. Their number has increased yearly. Jean-Yves Le Drian, the president of the Regional Council, had a goal of 20,000 pupils by 2010, but is encouraged by their progress. In 2007, some 4,500 to 5,000 adults followed a Breton language course (such as evening course, correspondence, or other). The family transmission of Breton in 1999 is estimated to be 3 percent. Growth of the percentage of pupils in bilingual education. Percentage of pupils in bilingual education per department. The 10 communes with the highest percentage of pupils in bilingual primary education, listed with their total population. The 10 communes of historic Brittany with the highest total population, listed with their percentages of pupils in bilingual primary education. In addition to bilingual education (including Breton-medium education) the region has introduced the Breton language in primary education, mainly in the department of Finistère. These "initiation" sessions are generally one to three hours per week, and consist of songs and games. Schools in secondary education (collèges and lycées) offer some courses in Breton. In 2010, nearly 5,000 students in Brittany were reported to be taking this option. Additionally, the University of Rennes 2 has a Breton language department offering courses in the language along with a master's degree in Breton and Celtic Studies. Vowels in Breton may be short or long. All unstressed vowels are short; stressed vowels can be short or long (vowel lengths are not noted in usual orthographies as they are implicit in the phonology of particular dialects, and not all dialects pronounce stressed vowels as long). All vowels can also be nasalized, which is noted by appending an 'n' letter after the base vowel, or by adding a combining tilde above the vowel (most commonly and easily done for a and o due to the Portuguese letters), or more commonly by non-ambiguously appending an ⟨ñ⟩ letter after the base vowel (this depends on the orthographic variant). The pronunciation of the letter ⟨r⟩ varies nowadays: [ʁ] is used in the French-influenced standard language and, generally speaking, in the central parts of Lower Brittany (including the south of Trégor, the west of Vannetais and virtually all parts of Cornouaille) whereas [r] is the common realisation in Léon and often in the Haut-Vannetais dialect of central Morbihan (in and around the city of Vannes and the Pays de Pontivy), though in rapid speech mostly a tapped [ɾ] occurs. In the other regions of Trégor [ɾ] or even [ɹ] may be found. The voiced dental fricative (/ð/) is a conservative realisation of the lenition (or the "spirant mutation" in cases where the phenomenon originates from the mutation of /t~θ/, respectively) of the consonants /d/ and /t/ which is to be found in certain varieties of Haut-Vannetais. Most of the Breton dialects do not inherit the sound and thus it is mostly not orthographically fixed. The Peurunvan, for instance, uses ⟨z⟩ for both mutations, which are regularly and more prominently pronounced [z] in Léonais, Cornouaillais, Trégorrois and Bas-Vannetais. In traditional literature written in the Vannetais dialect, two different graphemes are employed for representing the dental fricative, depending on the scripture's historical period. There once was a time when ⟨d⟩ was used to transcribe the sound, but today mostly the regular ⟨z⟩ is instead used, and this practice can be traced back to at least the end of the 17th century. The area this phenomenon has been found to be evident in encompasses the towns of Pontivy and Baud and surrounding smaller villages like Cléguérec, Noyal-Pontivy, Pluméliau, St. Allouestre, St. Barthélemy, Pluvigner and also parts of Belle-Île. The only known place where the mutation occurs outside of the Vannes country is the Île de Sein, an island located off Finistère's coast. Some scholars also used [ẓ] as the symbol for the sound to indicate that it was rather an "infra-dental" consonant than a clear interdental, which is the sound the symbol /ð/ is usually describes. Other linguists, however, did not draw that distinction, either because they identified the sound to actually be an interdental fricative (such as Roparz Hemon in his phonetic transcription of the dialect used in Pluméliau or Joseph Loth in his material about the dialect of Sauzon in Belle-Île) or due to the fact that they attached no importance to it and ascertained that their descriptions were not in need of a further clarification of the sound's phonetic realisation as it was a clearly distinguishable phoneme. As in other modern Celtic languages, Breton pronouns are fused into preceding prepositions to produce a sort of "conjugated" preposition. Below are some examples in Breton, Cornish, Welsh, Irish, Scottish Gaelic, and Manx, along with English translations. Note that in the examples above the Goidelic languages (Irish, Scottish Gaelic and Manx) use the preposition meaning at to show possession, whereas the Brittonic languages use with. The Goidelic languages, however, do use the preposition with to express "belong to" (Irish is liom an leabhar, Scottish is leam an leabhar, Manx s'lhiams yn lioar, The book belongs to me). Note also that the above examples of Welsh are the formal written language. The order and preposition may differ slightly in colloquial Welsh (Formal mae car gennym, North Wales mae gynnon ni gar, South Wales mae car gyda ni). Breton has four initial consonant mutations: though modern Breton lost the nasal mutation of Welsh, it also has a "hard" mutation, in which voiced stops become voiceless, and a "mixed" mutation, which is a mixture of hard and soft mutations. the first places the verbal infinitive in initial position (as in (1)), followed by the auxiliary ober 'to do'. the second places the Auxiliary verb bezañ 'to be' in initial position (as in (2)), followed the Subject, and the construction o(c'h) + infinitive. At the end comes the Object. the third places the construction o(c'h) + infinitive in the initial position (as in (3)), followed by the Auxiliary verb bezañ, the Subject, and the Object. the fourth option places the Object in initial position (as in (4)), followed by an inflected verb, followed by the Object. the fifth, and originally least common, places the Subject in initial position (as in (5)), followed by an inflected verb, followed by the Object, just like in English (SVO). Under influence from French, many modern-day (non-native) speakers prefer the fifth (SVO) option. It is also seen in many schools, and language methods. The English words dolmen and menhir have been borrowed from French, which took them from Breton. However, this is uncertain: for instance, menhir is peulvan or maen hir ("long stone"), maen sav ("straight stone") (two words: noun + adjective) in Breton. Dolmen is a misconstructed word (it should be taol-vaen). Some studies state that these words were borrowed from Cornish. Maen hir can be directly translated from Welsh as "long stone" (which is exactly what a menhir or maen hir is). The Cornish surnames Mennear, Minear and Manhire all derive from the Cornish men hyr ("long stone"), as does Tremenheere "settlement by the long stone". The French word baragouiner ("to jabber in a foreign language") is derived from Breton bara ("bread") and gwin ("wine"). The French word goéland ("large seagull") is derived from Breton gwelan, which shares the same root as English "gull" (Welsh gwylan, Cornish goelann). The first extant Breton texts, contained in the Leyde manuscript, were written at the end of the 8th century: 50 years prior to the Strasbourg Oaths, considered to be the earliest example of French. Like many medieval orthographies, Old- and Middle Breton orthography was at first not standardised, and the spelling of a particular word varied at authors' discretion. In 1499, however, the Catholicon, was published; as the first dictionary written for both French and Breton, it became a point of reference on how to transcribe the language. The orthography presented in the Catholicon was largely similar to that of French, in particular with respect to the representation of vowels, as well as the use of both the Latinate digraph ⟨qu⟩—a remnant of the sound change /kʷ/ > /k/ in Latin—and Brittonic ⟨cou-⟩or ⟨cu-⟩ to represent /k/ before front vowels. 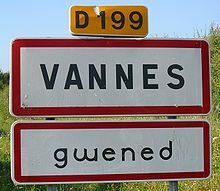 As phonetic and phonological differences between the dialects began to magnify, many regions, particularly the Vannes country, began to devise their own orthographies. Many of these orthographies were more closely related to the French model, albeit with some modifications. Examples of these modifications include the replacement of Old Breton ⟨-z⟩ with ⟨-h⟩ to denote word-final /x~h/ (an evolution of Old Breton /θ/ in the Vannes dialect) and use of ⟨-h⟩ to denote the initial mutation of /k/ (today this mutation is written ⟨c'h⟩). and thus needed another transcription. In the 1830s Jean-François Le Gonidec created a modern phonetic system for the language. During the early years of the 20th century, a group of writers known as Emglev ar Skrivanerien elaborated and reformed Le Gonidec's system. They made it more suitable as a super-dialectal representation of the dialects of Cornouaille, Leon and Trégor (known as from Kernev, Leon and Treger in Breton). This KLT orthography was established in 1911. At the same time writers of the more divergent Vannetais dialect developed a phonetic system also based on that of Le Gonidec. Following proposals made during the 1920s, the KLT and Vannetais orthographies were merged in 1941 to create an orthographic system to represent all four dialects. This Peurunvan ("wholly unified") orthography was significant for the inclusion of the zh digraph, which represents a /h/ in Vannetais and corresponds to a /z/ in the KLT dialects. In 1955 François Falc'hun and the group Emgleo Breiz proposed a new orthography. It was designed to use a set of graphemes closer to the conventions of French. This Orthographie Universitaire ("University Orthography", known in Breton as Skolveurieg) was given official recognition by the French authorities as the "official orthography of Breton in French education." It was opposed in the region and today is used only by the magazine Brud Nevez and the publishing house Emgléo Breiz. In the 1970s, a new standard orthography was devised — the etrerannyezhel or interdialectale. This system is based on the derivation of the words. Today the majority of writers continue to use the Peurunvan orthography, and it is the version taught in most Breton-language schools. Due to the deficient suitableness of those standardised, interdialectal orthography for many dialects (especially the Vannes dialect) they are seen as a threat by some activists, rather than as a helping tool for promoting and spreading the language because it endangers the rich variety of the still living dialects and encourages the usage of a de facto non-existent artificial language. See v:Introduction to Breton/Breton pronunciation for an introduction to the Breton alphabet and pronunciation. Both orthographies use the above alphabet, although é is used only in Skolveurieg. Differences between the two systems are particularly noticeable in word endings. In Peurunvan, final obstruents, which are devoiced in absolute final position and voiced in sandhi before voiced sounds, are represented by a grapheme that indicates a voiceless sound. In OU they are written as voiced but represented as voiceless before suffixes: braz (big), brasoc'h (bigger). In addition, Peurunvan maintains the KLT convention, which distinguishes noun/adjective pairs by nouns written with a final voiced consonant and adjectives with a voiceless one. No distinction is made in pronunciation, e.g. brezhoneg Breton language vs. brezhonek Breton (adj). ^ Vocative particle: â Vreizh O Brittany! ^ Non-written lenition of ch, c'h, f, s and spirantization of p > f [v]. ^ Unstressed vowels e, eu, o are pronounced [ɛ, œ, ɔ] in Leoneg but [e, ø, o] in the other dialects. The pronunciation [ɛ̞, œ̞, ɔ̞] appears mainly in front of clusters lc'h, rc'h (less often also before c'h), before semivowels [j, w], before other clusters beginning with r, l and before rr. Stressed long e, eu, o are realized as [eː, øː, oː]. ^ In Gwenedeg velars or labialized velars are palatalized when followed by e and i: k, g, kw/kou, c'hw/c'hou, gw/gou, w/ou, sk to [c, ɟ, cɥ, hɥ, ɟɥ, ɥ, sc/ʃc]. Instead of [c, ɟ] also [tʃ, dʒ] may appear. ^ In Gwenedeg word-final g and k is palatalized to [c] after preceding i. ^ But before a vowel other than i the digraph ni is written instead of gn, e.g. bleniañ to drive', radical blegn, 1PS preterite blegnis, 3PS preterite blenias. ^ But mute in words such as ha(g), he(c'h), ho(c'h), holl, hon/hor/hol. Silent in Gwenedeg and Leoneg. ^ I is realized as [j] when it precedes or follows a vowel (or when between vowels), but in words such as lien, liorzh, rakdiazezañ the letter i is pronounced as [iː] (in orthography ï may be used:lïen, lïorzh, rakdïazezañ). ^ Group ilh is pronounced [ʎ] when it follows an vowel, following a consonant the group is pronounced [iʎ]. But before a vowel other than i li is written instead of ilh, e.g. heuliañ to follow, radical heuilh, 1PS preterite heulhis, 3PS preterite heulias. In some regions instead of [ʎ] may appear pronunciation [j]. ^ Word-finally following a cluster of unvoiced consonants. ^ In front of k, g.
^ The digraph ou is realized same as the letter w when preceded or followed by a vowel (or when between vowels), but in words such as Doue, douar, gouarn the digraph ou is pronounced [uː]. ^ The digraph où marks plural ending. Its pronunciation varies throughout Brittany: [u, o, ø, ow, aw, aɥ, ɔɥ] rating geographically from Northwest Leon to Southeast Gwened. ^ The letter v is usually pronounced [v], but word-finally (except word-final ñv) is pronounced usually as [w] or in KLT, as [ɥ] in Gwenedeg and as [f] in Goëlo. The pronunciation [v] is retained word-finally in verbs. In words bliv, Gwiskriv, gwiv, liv, piv, riv are v is pronounced [u] in KLT, [ɥ] in Gwenedeg and [f] in Goëlo. Word-finally following r, l, n, z it is pronounced [o]. ^ But mute in words such as gouez, bloaz, goaz, ruziañ, kleiz, rakdïazezañ, bezañ, Roazhon, dezhañ, kouezhañ, 'z, az, ez, da'z, gwirionez, enep(g)wirionez, moneiz, falsvoneiz, karantez, kengarantez, nevez, nevezc'hanet, nadozioù, abardaez, gwez, bemdez, kriz, bleiz, morvleiz, dezhi . Z is generally mute in Kerneweg, Tregerieg and Gwenedeg, but in Leoneg z(h) is always pronounced. ^ Used to distinguish words stêr river, hêr heir, kêr town (written also kaer) from ster sense, her bold, ker dear. ^ Used to distinguish trôad circuit/tour from troad foot. ^ In northern dialects (mainly in Leoneg), there is a tendency to voice c'h between vowels. Pronunciation [ɣ] appears also in forms of lenition of g, c'h and mixed mutation of g.
^ The lenition of d and the spirantization of t is also transcribed as z and is most prominently pronounced [z] although in certain regions also [s] (for t, particularly in Cornouaille) and [ð] (in some Haut-Vannetais varieties, see note 31) occur. ^ Pronunciation of r varies in Brittany, nowadays uvular [ʀ] (or [ʁ]) is a standard; in Leoneg r is pronounced [r], in Tregerieg [ɾ] or [ɹ], in Kerneveg [ʀ] and [ʁ] are most common, in Gwenedeg [ʀ], [ʁ], [r], [ɾ] occur. ^ In Gwenedeg unstressed e often [ə]. ^ Lenited varieties of r, l, n may appear word-initially in case of soft mutation. ^ In Leoneg [u(ː)] in front of a nasal. ^ In Leoneg w in front of e, i [v]. ^ In Leoneg z(h) in front of i [ʃ] or [ʒ]. ^ In Leoneg gwr [ɡr]. ^ Forms of the indefinite article. ^ A conservative realisation of the initial mutation of d and t, used in certain parts of the Vannes country. evel m'hor bo ivez distaolet d'hon dleourion. Bilingual signage in Quimper/Kemper. 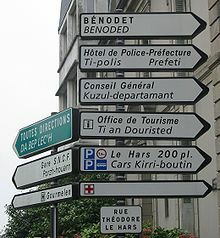 Note the use of the word ti in the Breton for police station and tourist office, plus da bep lec'h for all directions. ^ a b c d "ENQUÊTE SOCIO-LINGUISTIQUE : QUI PARLE LES LANGUES DE BRETAGNE AUJOURD'HUI ?". Région Bretagne. Retrieved 9 October 2018. ^ Diagnostic de la langue bretonne en Île-de-France. Ofis Publik ar Brezhoneg. ^ a b c Broudic, Fañch (2009). Parler breton au XXIe siècle : Le nouveau sondage de TMO Régions (in French). Emgleo Breiz. ^ Hammarström, Harald; Forkel, Robert; Haspelmath, Martin, eds. (2017). "Breton". Glottolog 3.0. Jena, Germany: Max Planck Institute for the Science of Human History. ^ Bauer, Laurie (2007). The Linguistic Student's Handbook. Edinburgh University Press. ^ Donald MacAulay (1992). The Celtic Languages. Cambridge University Press. p. 371. ISBN 978-0-521-23127-5. ^ "Breton language". Encyclopedia Britannica. Retrieved 2017-09-18. ^ Koch, John T. (2006). Celtic Culture: A Historical Encyclopedia. Santa Barbara, California: ABC-CLIO. OCLC 62381207. ^ a b Kuter, Lois (May 2004). "Breton – An Endangered Language of Europe". breizh.net. ^ Broudic, Fañch (1999). Qui parle breton aujourd'hui? Qui le parlera demain? (in French). Brest: Brud Nevez. ^ Francis Favereau, "Anthologie de la littérature bretonne au XXe siècle : 1919-1944", "Tome 2 : Breiz Atao et les autres en littérature", Skol Vreizh, 2003, ISBN 2-911447-94-8. ^ Calin, William (2000). Minority Literatures and Modernism: Scots, Breton, and Occitan, 1920-1990. University of Toronto Press. ISBN 9780802083654. ^ an Henaff, Goulwena; Strubel, Etienne (2008). Ken Tuch' (Web videos) (in Breton). An Oriant, Breizh: Dizale. Retrieved 25 February 2015. ^ Adkins, Madeleine; Davis, Jenny L. (September 2012). "The naïf, the sophisticate, and the party girl: Regional and gender stereotypes in Breton language web videos". Gender and Language, Special Issue: Gender and Endangered Languages. 6 (2): 291–308. doi:10.1558/genl.v6i2.291. Pdf. ^ "Celtic languages". Encyclopedia Britannica. Retrieved 2017-09-18. ^ Wmffre, Iwan (2008). Breton Orthographies and Dialects: The Twentieth-century, Vol. 2. Peter Lang AG, Internationaler Verlag der Wissenschaften. p. 3. ISBN 3039113658. ^ Kergoat, Lukian. "Breton Dialects" in Celtic Culture, pp. 250 ff. ABC-CLIO (Sta. Barbara), 2006. ^ EOLAS. "Situation de la langue". Office Public de la Langue Bretonne (in French). ^ Simon Hooper. "France a 'rogue state' on regional languages". Al Jazeera. Retrieved 30 March 2012. ^ "Le Sénat dit non à la Charte européenne des langues régionales" [The Senate says no to the European Charter for Regional Languages]. www.franceinfo.fr (in French). franceinfo. 27 October 2015. Retrieved 1 November 2015. ^ "Ofis ar Brezhoneg". Ofis-bzh.org. Retrieved 2010-10-03. ^ "The Center for Advanced Research on Language Acquisition (CARLA):Articulation of Language Instruction". carla.umn.edu. Retrieved 2017-09-18. ^ Rostrenn, Yannick /. "Actualités" (in French). div-yezh.org. ^ "Dihun - Dihun Language". ^ "Interview with Jean-Yves Le Drian, the president of the Region Council". angencebretagnepresse.com. ^ a b "Populations légales 2007". www.insee.fr (in French). ^ These figures include some cities in the department of Loire-Atlantique, which today is technically included in Pays de la Loire. See for example Brittany (administrative region). ^ "L'option de breton : que faire ?". Studi : enseigner le breton et en breton. 2010-06-20. ^ Hemon, Roparz; Everson, Michael (2007). Breton Grammar (2 ed.). Evertype/Al Liamm. ISBN 978-1-904808-11-4. ^ Hemon, Roparz, ed. (1956). Christmas Hymns in the Vannes Dialect of Breton. Dublin: Dublin Institute for Advanced Studies. pp. x, xxvi. ^ Jackson, Kenneth H. (1968). A Historical Phonology of Breton. Dublin: Dublin Institute for Advanced Studies. pp. 661 ff. ^ Hemon, Roparz (1975). A Historical Morphology and Syntax of Breton. Dublin: Dublin Institute for Advanced Studies. p. 5. ISBN 978-0901282637. ^ Hemon, Roparz (1975). A Historical Morphology and Syntax of Breton. Dublin: Dublin Institute of Advanced Studies. p. 5. ^ le Goff, Sébastien. "Breton Guéned, Le breton vannetais". projetbabel.org. Retrieved 2017-01-05. Jackson, Kenneth H. (1967). A historical phonology of Breton. Dublin: Dublin Institute for Advanced Studies. ISBN 978-0-901282-53-8. Stephens, Janig (1993). "Breton". In Ball, Martin J.; Fife, James (eds.). The Celtic languages. Routledge language family descriptions. Abingdon; New York: Routledge. pp. 349–409. ISBN 978-0415280808. Schrijver, Peter (2011). "Middle and early modern Breton". In Ternes, Elmar (ed.). Brythonic Celtic – Britannisches Keltisch: From medieval British to modern Breton. Bremen: Hempen Verlag. pp. 359–430. ISBN 9783934106802. Schrijver, Peter (2011). "Old British". In Ternes, Elmar (ed.). Brythonic Celtic – Britannisches Keltisch: From medieval British to modern Breton. Bremen: Hempen Verlag. pp. 1–84. ISBN 9783934106802. Ternes, Elmar (2011). "Neubretonisch". In Ternes, Elmar (ed.). Brythonic Celtic – Britannisches Keltisch: From medieval British to modern Breton. Bremen: Hempen Verlag. pp. 431–530. ISBN 9783934106802. Ternes, Elmar (1992). "The Breton language". In MacAulay, Donald (ed.). The Celtic languages. Cambridge language surveys. Cambridge; New York; Oakleigh: Cambridge University Press. pp. 371–452. ISBN 978-0521231275. Wikimedia Commons has media related to Breton language. For a list of words relating to Breton, see the Breton language category of words in Wiktionary, the free dictionary. France 3 breizh , the public Breton TV channel. Breizh (blog) : Brittany information, articles about Breton. Jouitteau, M. Grammaire du breton, (extensive Breton grammar in French, with glossed examples and typological comparisons), IKER, CNRS, 2009 > 2017].